Step through the doors of the Hôtel Haussmann Saint-Augustin, in the heart of Paris, and you will be entering a delightful and quintessentially Parisian three-star hotel in a cosy and sophisticated setting. Stay in one of our 34 modern and inviting rooms. 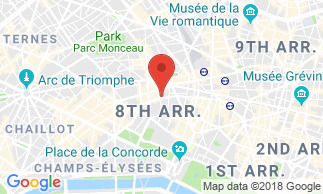 Despite being in the heart of the 8th arrondissement, the hotel guarantees peace and quiet, and boasts a privileged location in what is a central district and tourist hotspot. Set out on foot and discover the famous avenue des Champs-Elysées, Faubourg Saint-Honoré, the Madeleine district and the majestic Place de la Concorde. A gourmet buffet breakfast is served every morning in a pleasant and inviting room. Our team would be delighted to provide you with advice and guidance on discovering what Paris has to offer. As part of our concern for your well-being, we are always attentive to your needs and focused on satisfying your expectations. Stay in one of our 34 rooms. Both modern and inviting, all rooms are non-smoking. With their chestnut-beige and burgundy tones, select choice of fabrics and furniture crafted from wenge wood, our rooms will ensure visitors a cosy stay. The rooms can accommodate from one to three people. All our rooms feature all the amenities and conveniences that you will need for a pleasant stay and a good night's sleep : private bathroom wiht hairdryer and magnification mirror, safe, telephone, office area, satellite/cable TV, air conditioning, high-end bedding, reading light, minibar, hospitality welcome tray. Nespresso® coffee machine and Nuxe® courtesy products in the Superior and Privilege rooms. Single room: Occupying an area of approximately 11.5 m² (bathroom included), they are mainly intended for business travellers or people in search of a cost-effective room while enjoying a short stay in Paris. Classic room: The comfortable Classic rooms range between 12 and 15 m² (bathroom included) and feature a double bed for one or two people. Most of the contemporary bathrooms are fitted with a walk-in shower and comprise high-quality courtesy products. Superior room: Occupying between 16 and 20 m² (bathroom included), our Superior rooms come with a queen-size bed or two single beds as required. In addition to the amenities of a Classic room, our Superior rooms also offer the following: Bathrobe and slipper, Nespresso® coffee machine and Nuxe® courtesy products. Privilege room: Ranging between 21.5 and 25 m² (bathroom included), our Privilege rooms are the most spacious in the hotel. They can be prepared with a king-size bed or two single beds. All Privilege rooms feature a sofa, and some can accommodate two adults with a child or three adults. Overlooking our inner courtyard, our Privilege rooms are synonymous with peace and quiet. These luxury rooms guarantee a pleasant stay and include the following amenities: High-end beddin, bathrobe and slipper, Nespresso® coffee machine, iPod® docking station, Nuxe® courtesy products and other thoughtful touches conducive to relaxation or work. Within easy reach of the capital's luxury stores, restaurants and famous show halls, the Hôtel Haussmann Saint-Augustin serves as the ideal base for visiting Paris with friends or family, and heading for the most stylish stores for a shopping spree. The hotel's central location also guarantees business travellers quick access to Paris's main business districts. The Palais des Congrès convention centre at Porte Maillot and La Défense business district are a mere 20-minute metro ride away (direct via line 1). A gourmet buffet breakfast is served every morning in a pleasant and inviting room. French pastries, fresh bread, cereals, dairy products, fruit juice, hot drinks, scrambled eggs, cold meats, sausages, pancakes... nothing has been overlooked in our desire to offer a full menu and help get your day off to the right start. Breakfast can also be served in the intimacy of your room if required. Breakfast is not included in the room rate: 13 EUR per person.